We interrupt this Pentecost prep for a unique bit of Bench History. Sure, a week from today in the City of Angels will see just the third occurrence of one rite in Catholicism's four-century journey on these shores... today, however, marks the 100th anniversary of another act that remains without equal in the life of the Stateside church: the ordination of six bishops in one fell swoop. 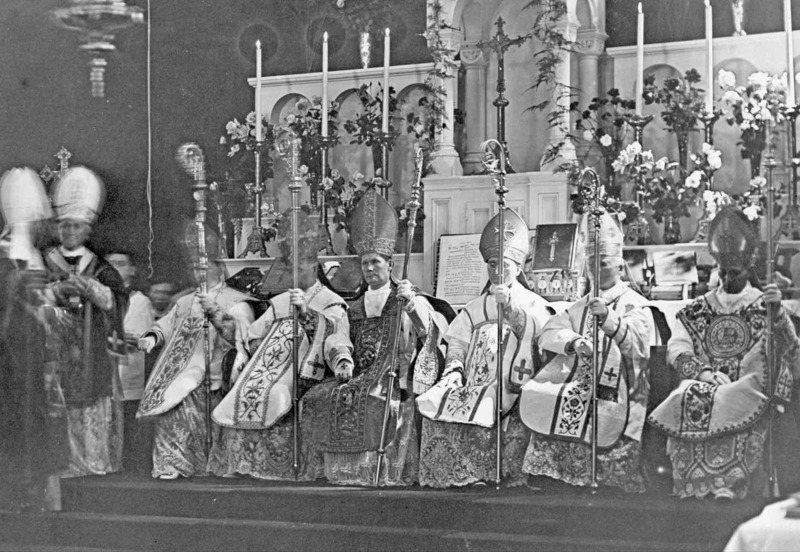 Like today's rapid growth in parts South and West, the sextuple high-hatting was the fruit of a quickly-burgeoning Catholic population in the Upper Midwest, and provided a crowning moment for the region's undisputed ecclesial builder-prince: John Ireland (above left, standing) the hometown product whose 34-reign over the church in Minnesota and the Dakotas saw the first archbishop of St Paul become one of the nation's most outspoken prelates and, at his peak, arguably the most powerful American cleric of his era -- the first non-Easterner to lay claim to the distinction. With Ireland's twin seats -- the capital's Cathedral of St Paul and Minneapolis' St Mary Pro-Cathedral (made the nation's first minor basilica in 1926) -- then at mid-construction, the four-hour spectacle was held in the local seminary chapel, its capacity easily overflowed. » Timothy Corbett, 51, new Diocese of Crookston. » Patrick Heffron, 50, Diocese of Winona. » John Lawler, 47, auxiliary bishop of St. Paul. » James O’Reilly, 54, Diocese of Fargo, N.D.
» John Wehrle, OSB, 54, new Diocese of Bismarck, N.D. The event was occasioned by the deaths of two bishops, the resignation of another, the need for an auxiliary in St. Paul and the creation of two new dioceses in the Province of St. Paul. Archbishop Diomede Falconio, papal apostolic delegate, 21 bishops, hundreds of priests and religious, local dignitaries and family members attended. Others circulated outside on the seminary grounds, hoping to catch a glimpse of the proceedings. A newspaper photo shows Minnesota Gov. Adolph Eberhardt flanked by an impressive military entourage, trimmed in gold uniforms. The governor stood at attention with his entourage outside the chapel while all the ecclesiastical dignitaries filed in. He then took his own seat, it was noted by the newspaper, in the back of the church! The youngest of the group, Busch was the last survivor of Ireland's "sextuplets" when he died in 1953, aged 87. All of 44 at the ordination, he spent just shy of half his life as a bishop... and all of it in active ministry; the retirement age of 75 wouldn't come into force for another decade and a half. Meanwhile, it might not have happened at once, but history does have its ways of repeating itself: in just the last three years, five Twin Cities priests have been elevated -- four to dioceses, one as a local auxiliary.